multi-media educational materials or attend a workshop. • Oil paint or printing ink in any colors you like. We recommend water mixable oils. • Printmaking roller (brayer) to roll the paint smooth. • A smooth, nonabsorbent surface like glass, plastic or dry erase board for a drawing surface. • Plenty of paper: lightweight wrapping tissue is good but anything will work. • Put a small amount of paint on the drawing board. It is best to start with one color. • Roll the paint smooth and place a sheet of paper on top of the paint. • Touch the paper with your fingernails, fingertips and palms. Try using both hands some of the time. • Try drawing with your eyes closed. Let your hands dance on the page. • Become aware of body sensations and trace them on the paper. They might be abstract patterns or images. • Lay the drawings on top of one another as they are done. • Roll the board smooth between drawings. Only add paint after a few drawings. • Draw whatever you feel in the moment. They do not have to be ‘pretty pictures’. • The longer you stay with it, the deeper you will go. • When you are finished drawing, roll the paint smooth and leave it to dry. • Look at the drawings in order from first to last as a record of your inner process. • It is helpful to have a partner. • Use journal writing techniques to reflect on your images. • Number and date each set of drawings. • Select some to embellish with color when they are dry. 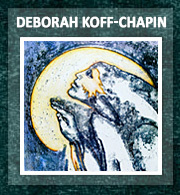 Deborah Koff-Chapin has been developing Touch Drawing™ since 1974. Please give our website address to people you share Touch Drawing with. 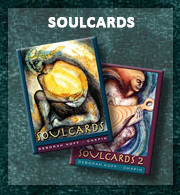 Deborah’s workshops are transformative experiences. 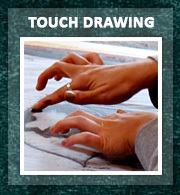 The most inspirational event is the annual Touch Drawing Gathering. You can start doing Touch Drawing on your own using our media and materials. 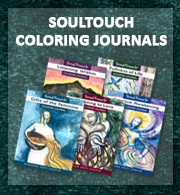 If you plan to introduce Touch Drawing to others, please purchase the DVD and Facilitator Workbook.